Thank you! I”ve recently been tuning in every morning and had forgotten how much I so enjoy classical music! It”s wonderful to be able to tune you in upstairs and downstairs…great stereo!…and enjoy the music as I ready my day! I realized how much this station means to me and decided I had to support it financially. Thank you again! We thank Ms. Woods for taking the time to write — and especially for her generous gift to WDAV. 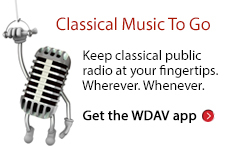 If great classical music is valuable to you too, we hope you”ll follow Ms. Wood”s lead and make your gift to WDAV today. Call 1-877-333-8990 or . And thank you!